With today’s vote the European Union made an important step to secure a more affordable and climate-friendly energy system to European citizens. This new governance system introduces the Energy Efficiency First principle for the first time in the EU regulatory framework. 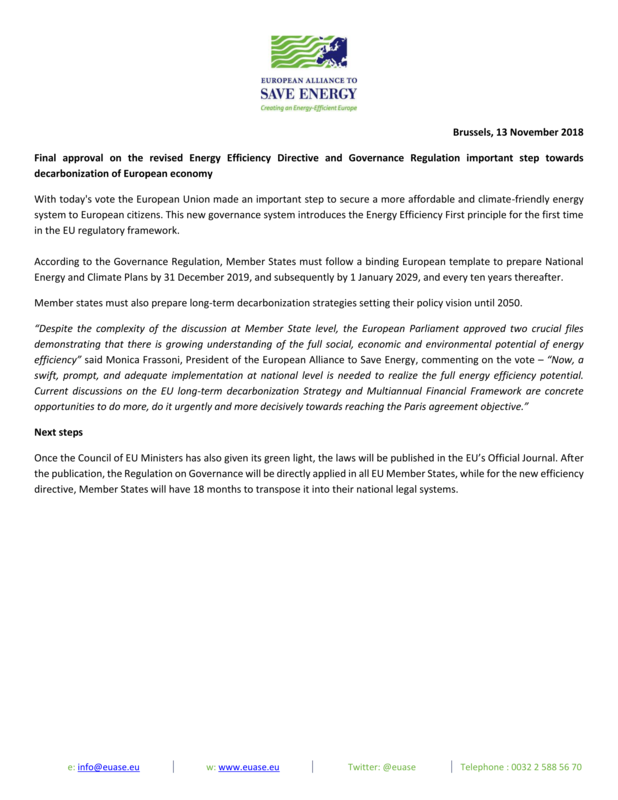 According to the Governance Regulation, Member States must follow a binding European template to prepare National Energy and Climate Plans by 31 December 2019, and subsequently by 1 January 2029, and every ten years thereafter. Member states must also prepare long-term decarbonization strategies setting their policy vision until 2050. Once the Council of EU Ministers has also given its green light, the laws will be published in the EU’s Official Journal. After the publication, the Regulation on Governance will be directly applied in all EU Member States, while for the new efficiency directive, Member States will have 18 months to transpose it into their national legal systems.